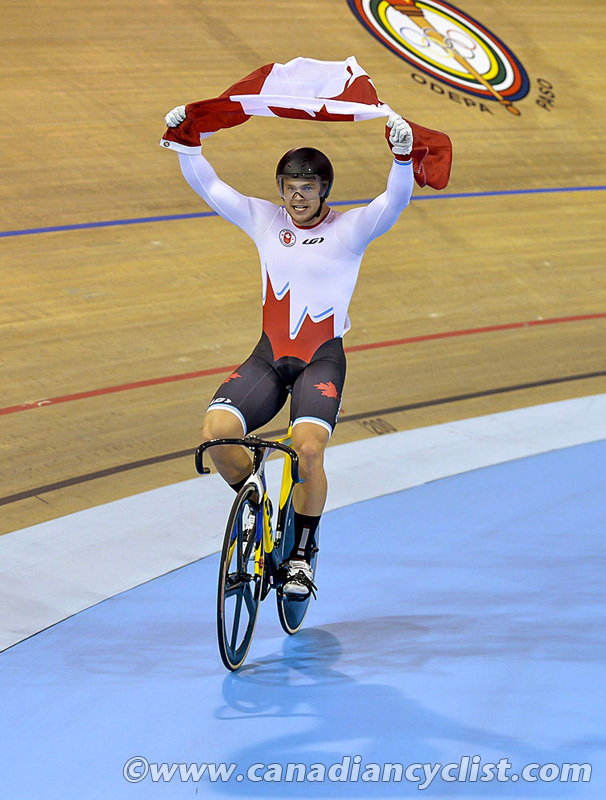 Canadian track cycling sprint specialist Hugo Barrette is expected to return to competition this weekend at World Cup #2 in Cambridge, New Zealand. The return comes after suffering serious injuries on October 27th, as a result of a crash in training while preparing for the opening World Cup of the season in Cali, Colombia. "I was on my second effort of the day on the track and decided to open it up, making my first 100% effort. I took the bank, very tight in Cali, much faster than what I thought, and coming out with the slingshot effect I lost control. So I tried to climb the track to slow me down but I was going too fast," remembers Barrette. Barrette collided with the safety wall at a speed of about 70 km/h. The result: two broken lumbar vertebrae, a broken nose, split lip, concussion, neck dislocation and severe contusions throughout his entire body. "After two weeks of lying in a hospital bed in Cali I started training at very low intensity, remaining careful and vigilant," says Barrette. "But I soon realized that I was recovering quickly from the accident. Then just a week later I was back on the track." Since then, Barrette has undertaken a modified training program that will allow him to return to the World Cup with the hopes of qualifying for the Olympics, which are fast approaching in August 2016. This return to training, albeit at low intensity, is the starting point for Barrette. With the guidance of his coach, Olympic medalist Erin Hartwell, Barrette will take the necessary time to return to full fitness and return to racing at his full potential. "As far as the training program goes, I go day-by-day. Some days I feel almost back to full potential, and other days, it's not there. It is in these moments that I apply the experience I have gained over the last few years to decide what I should do." In his early return to training, Barrette deployed efforts at 80-90%, so it's difficult to determine where he now sits with regards to fitness. Last week, in the 200m time trial, he came very close to the time he posted before the crash. Barrette was introduced to the world stage at the 2009 World Championships when he was only 19 years old. A developing hockey player in the Magdalen Islands until the age of 16, he initially started riding as a means to get fit for hockey. Not long after his first session on two wheels he was hooked on the sport of cycling. Since then he has honed his craft at velodromes in Los Angeles, at the World Cycling Centre in Aigle, Switzerland, and, since its opening in January 2015, at the Mattamy National Cycling Centre in Milton, Ontario. In 2014, he achieved his first breakthrough international result, finishing eighth in the Keirin at the UCI World Cup Guadalajara, with his latest international results being three medals - including two gold - at the Pan Am Games this past summer. These results, among others, propelled him into twelfth place on the world ranking list in the discipline where he sits right now, which places him in a good position for potential Olympic selection. He is determined to be in Rio in August 2016. "It's kind of a headache now [for the Olympic qualifications] because I could easily go back to the same shape I was before the crash with two months free of competitions. But we are in the middle of the season, so I have to race despite the crash - which I think is an interesting challenge. I have to go with it one race at a time." "I remain positive with the situation. I feel that my body is ready to return to action. Realistically, I do not think I'll be at the peak of my performance by the third World Cup. But I do not think my injuries will cause negative effects for the Olympics. Rather, it motivates me to push myself beyond where I was, and this will help me in the future, no doubt."